A NATO summit convening today in the United Kingdom may have been the incentive France needed to finally suspend delivery of a nearly operational warship to Russia, NATO’s newly revived chief adversary. After a national security meeting at the Elysee Palace, French President Francois Hollande’s office released a statement saying that the “conditions for France to allow the delivery of the first BPC are not there.” The decision is a postponement of the Mistral-class warships’ sale, not a cancellation, at least for the time being. Still, it is an about-face for the French, who had up until now resisted pressure from their NATO allies to scrap the deal in light of Russia’s blatant aggression in Ukraine and its implied threat to Poland and the Baltic states. 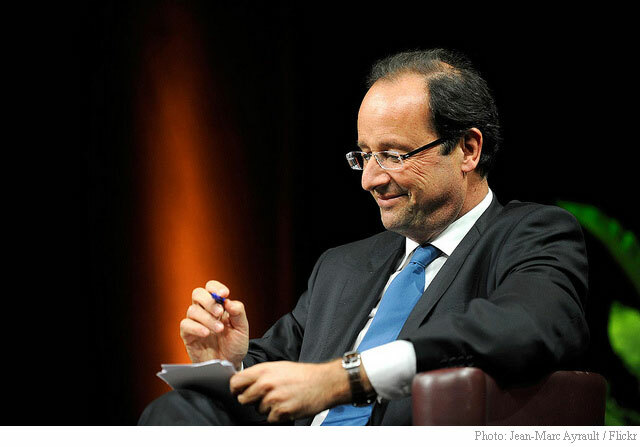 France had signaled it planned to go ahead with the deal as recently as Monday. There was no other reasonable option for the French other than to suspend the deal. They would have been supplying offensive capability to a country that is a direct threat to NATO allies had they gone ahead with the 2011 agreement to provide two Mistrals to Vladimir Putin’s navy. Though Russia denies that it is sending troops and equipment to support Ukrainian separatists, this has not stopped Putin from demanding a ceasefire from Kiev and outlining a plan to entrench rebels’ regional gains. Until yesterday, the French position was that European Union sanctions against Moscow could not apply retroactively and that canceling the contract would have been too costly. The truth, however, was that France is a part of NATO, and if it wishes to remain one, it must honor the guarantee of mutual defense the treaty includes. France might ultimately be forced to cancel the deal outright, but the suspension is a step in the right direction. It will certainly make for a less awkward summit in Wales, especially since Ukrainian President Petro Poroshenko will attend. While the decision not to sell Russia the Mistrals will check Russia’s amphibious capability, it will do little, if anything, to actually help Ukraine. What the Ukrainians desperately need is weapons and gear in order to defend themselves against a Russian invasion. All they have gotten up to this point is sanctions and talk. In Estonia yesterday, President Obama sought to reassure the Baltic states by declaring that the U.S. would honor its NATO obligations for mutual defense. He also declared that Washington would stand with non-NATO Ukraine, in the latest instance of pro-Ukrainian rhetoric untethered from clear action. NATO’s plans to base troops in eastern European nations is a start, but again, will do little to help Ukraine. And even the sanctions themselves have served as a point of contention among NATO countries, as economic concerns jostle against the ability to recognize the military threat an unchecked Russia could pose to alliance members. Hollande’s decision recognizes that France must sacrifice even a powerful economic interest due to the changing security situation. Still, the Mistral deal’s suspension is really just a more powerful version of sanctions. It may serve to moderate Russian behavior, but it won’t get any troops currently in Ukraine to go home. And while it will doubtless annoy Moscow, suspending the sale will not prevent Russia from moving forward with the course it has selected for itself. But at least France is acting like an ally of the Baltic countries, rather than an arms merchant to Putin. It took longer than it should have, and it is not enough on its own, but France’s decision is finally a step back in the right direction.